Through Tenons are a new joint for me. I have made a total of two and now I’m looking ahead to making 8 more. 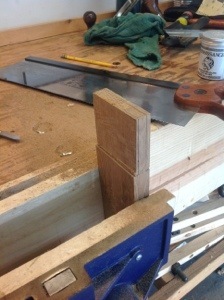 Using a saw to cut the tenons I stayed away from the marks and used a router plane to close in on the correct thickness. 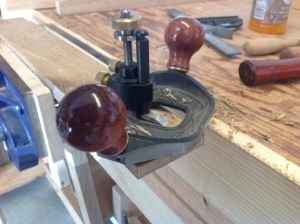 Using my router plane was very relaxing and provided a lot of control as I trimmed the Tenons. 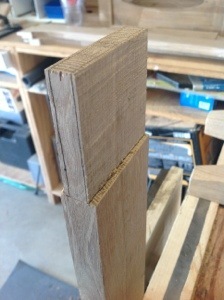 I managed to get the first four Tenons looking fairly good and it is clear that as my confidence grows I can cut closer to the lines. 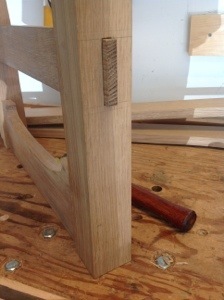 I’ll shape the exposed mortises tomorrow and then on to the under shelf. Thanks, I saw your claw foot the other day… Awesome. Looks like you have been making then for years! I love the through tennon, You can take one look and see the quality of the piece. I did a pine end table a few months back as a hand cut through tenon intoduction but they didnt turn out as nice as your first ones. Great work. Thanks for stopping by my blog. I stopped over at yours and was awed at some of the work you are doing. I’m definitely following.